Our beloved Mother, Grandmother, and Sister Michele Rene Headdress Buck Elk, passed away peacefully at Faith Lutheran Home on Saturday, April 6, 2019. Michele was born June 13, 1954 to Dale and Norma Gregg Headdress. She was the 7th of 13 children and the first girl. Mom grew up west of Wolf Point until the age of 8 and then the family moved to Poplar. She attended schools in Wolf Point and Poplar, later earning her GED. She moved to Oregon and worked at the Kah-Nee-Ta Resort on the Warm Springs Indian Reservation. She spoke fondly of her time there and the people she met. She moved back to Montana where she met the love of her life Michael Ray Buck Elk of Fort Kipp. They were married June 4, 1974 at the LDS church in Poplar. From this union they were blessed with 3 children. Carson, Alysia, and Michael Buck Elk. 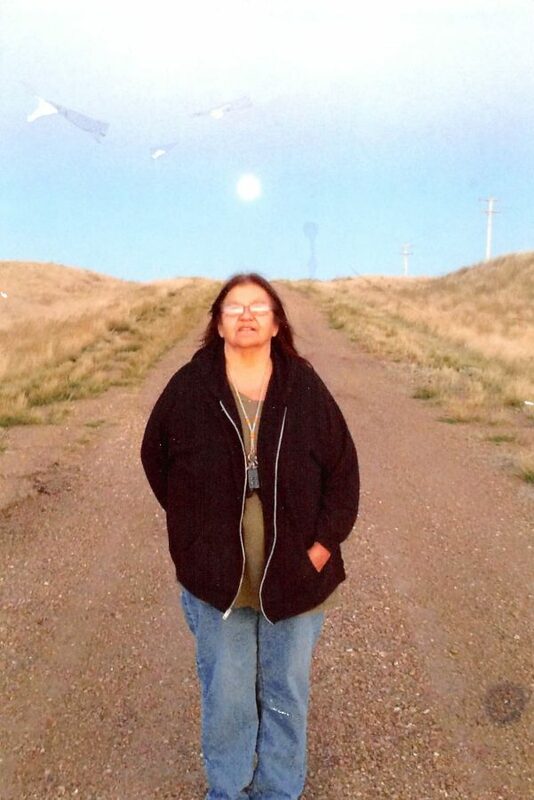 She began her career with the Fort Peck Tribes in 1974 then moving on to work for the Bureau of Indian Affairs where she started as a probate clerk and eventually worked her way up to Realty Officer when she retired in 2009 after 35 years of service. Mom loved helping her native people and she was highly respected in the field of probate. After retirement from the BIA she took on a job at Fort Peck Energy working in the Oil Industry. She then contracted with the Fort Peck Tribes to write wills for our tribal members. She continued this work until her health declined. Mom loved to garden, bead, attend pow-wows, fish and attend her grand childrens sporting events. She was their #1 fan. She loved spending quality time with her grandchildren, they were her world. Michele is survived by her children Carson (Kiedra) Buck Elk, Alysia (Brandon) Williamson, Michael Buck Elk and Cloelle Buck Elk; 10 grandchildren, Tristin, Joseph, Sarah, Jonah, Ian, Andrew, Paul, Clay, Emily, and Savannah; 3 great-grandchildren, Peyton, Aariyah, and Donovan Vallie; 8 brothers, Dale (Kayleen) Headdress, Charles Headdress, Arlyn Headdress, Henri (Patty) Headdress, LeRoy Headdress, Sheldon Headdress, Lonnie (Juanita) Headdress, Larry (Pearl) Headdress; 3 sisters, Shannon (Bernie) Gonzalez, Ione (Jay) Hanson, and Doris Headdress Thompson; brother-in-law Robert Buck Elk; sisters-in-law Gloria Yankton, Bernadine (Arthur) Mandan, Roberta (Charlie Moran) Baker Juanita and Adelaide Baker; aunt Vivian Pankowski; and over 70 plus nieces and nephews. Mom was preceded in death by her parents; husband Michael Ray Buck Elk; granddaughter Rachel Williamson and brother Mitchell Headdress. A prayer service will be held Thursday, April 11, 2019 at 7 p.m. at the Clayton Stevenson Memorial Chapel. Funeral services will be 11 a.m. Friday, April 12, 2019 at the Wolf Point Community Hall. Burial will be at the Headdress Family Cemetery 3 miles west of Wolf Point. Isaiah 40:31: But they that wait upon the Lord shall renew their strength. They shall mount up with wings as Eagles. They shall run and not be weary and they shall walk and not faint. Clayton Stevenson Memorial Chapel of Wolf Point has been entrusted with the arrangements and condolences may be left for the family by using the form below. Carson and Alicia I am so sorry for your loss. Your mother was a great woman and always kind. Mike and I offer our deepest condolences. Rest in perfect peace my cousin/ friend from way back. Michele was an awesome coworker and in law. Condolences to Alysia, Carson, Michael & grandchildren, brothers & sisters. Michele is in a deep sleep and her beautiful spirit is alive. One day soon we all will be united with our loved ones. Sad to hear of my aunt passing, condolences to my cousins and their families and to the Headdress families. CONDOLENCES TO MICHELLE’S FAMILY AND CHILDREN, WE WILL CONTINUE TO KEEP YOU IN OUR PRAYERS. Rest in Peace, Michele. It was so nice knowing you. You will be missed. Deepest sympathy to her family. Michele had so much love for her whole family. I am sorry to hear of Michelle’s passing but now she will be with her parents, siblings, and other relatives. God bless the family and comfort them. Were gonna miss you grandma! Stay strong Kell, Sarah, Alysia, Carson, and more! I’ll continue to pray for the family! Sincerest condolences to all my cousins, the Headdress and Buck Elk families. Michele is no longer in pain and in a whole new body patiently waiting and united with the rest of her family. She now is your Heavenly Angel watching over the rest of her family, loving you all from her new place in glory. Rest easy cousin, you will be missed. I was so grateful to have had the chance to visit with my cousin Michele before her passing. We had a nice long visit the day before she was to go back to Wolf Point from Billings. She was funny and feisty and anxious to get back home to her family. Condolences to all her family. We will all miss her. Condolences to Carson, Alysia, and Michael and to all the other Headdress families during this most difficult time. My thoughts and prayers are with you all. Your Mom was a wonderful lady. I worked at BIA with her for many years. To my old neighbor, my mothers good friend. Thanks for crossing our paths. To her children, grandchildren and families prayers for strength n my sincere heartfelt condolences. Condolences to the family, My friend is no longer in pain. She will be missed. Prayers for the family. Dearest cousins Judith and I are so very sad. We will always remember the wonderful time we spent with Michele and the rest of the family. We would be there if we could. Michelle for me you were always so sweet and kind and you were just like Auntie Norma in your mannerisms! You are now with those who went before you and I’m sure they welcome you with open arms and huge hugs! We all love you and will miss that smile! Tell Mike and your dad and mom hello for me! Also tell Mom and Grandpa and Grandma that we all miss them as well! Deepest sympathy to all of Michele’s loved ones. May twelve of the Creator, and the care and love of family and friends bring healing and peace to your hears. Uplifting you in prayer. Condolence to Michele’s children, grandchildren & the Headdress family. We so sorry for your loss.